Hello:) Here is another cake for my "Saturday Sweets" post. 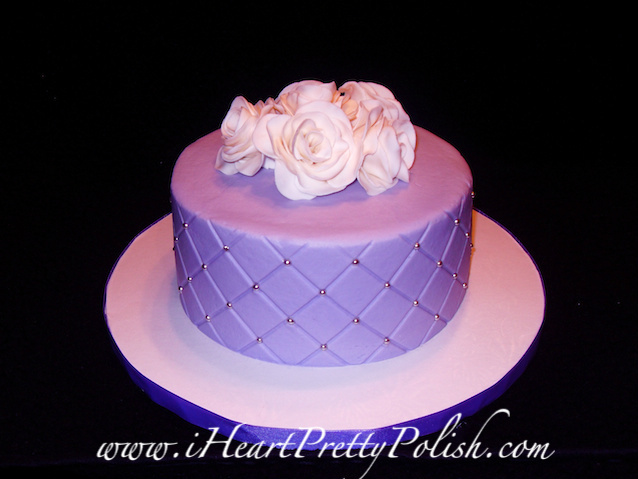 I bought a diamond impression mat that makes this diamond pattern on the cake (it made it really easy to do). I placed a silver dragee in each intersection and loved the final look. I threw some fondant roses on the top and called it a day. This was a chocolate cake with milk chocolate ganache filling. Buttercream frosting. This one's gorgeous. So elegant. Milk chocolate ganache... oh my. Thanks! Yep, it was yummy! I brought this one to work.